The Zaachila market is held every Thursday and is the most traditional of all the tianguis, since it is completely outdoors, there are also vendors who sit on the floor with extended tablecloths to display their merchandise. Zaachila was historically the Zapotec capital of Oaxaca after Monte Alban fell under the control of the Mixtecs, therefore, it became a focal point for trade within the Oaxaca Valley. Nowadays the Zaachila market is practically the same, sellers and consumers of the surrounding villages come to the Zaachila market to do business with all the necessary things for the day to day. 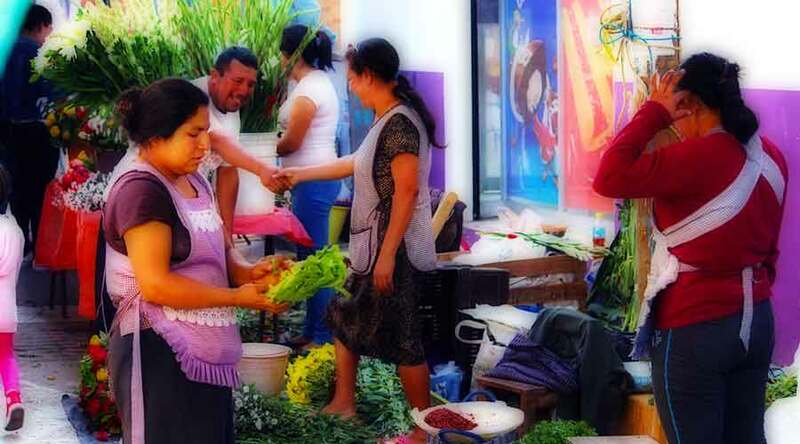 In the Zaachila market you will find a wide variety of flowers, fruits, vegetables, tools, seeds, dry foods and much more; There is even a prosperous livestock market. Everything happens in front of the monumental “Clock” of the community, next to the main temple, where the open-air dining rooms offer their exquisite gastronomy to those who like typical Oaxacan dishes and gastronomic appetizers, for example, in the lunches there are enmoladas, green enchiladas, enfrijoladas and entomatadas accompanied by eggs, chorizo, jerky, or fried chicken, plus memelas, empanadas, tacos dorados, broths, and so much more. There are stalls selling Oaxacan products such as Nicuatole, chilacayota water, mezcal, as well as the traditional Tejate, better known as the “Drink of the Gods” and originally from San Andrés Huayapam but prepared in Zaachila. Every Thursday of every week there is a colorful encounter between the human and the oldest party in the world … the tianguis, these have endured for centuries. You will live an unforgettable and invaluable experience at the Zaachila Market.